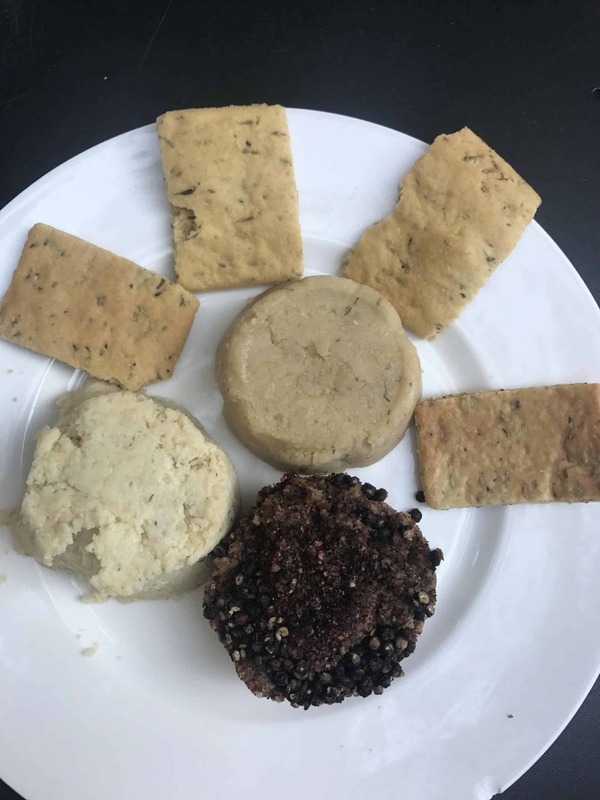 I’ve tried a lot of vegan cheeses in London (and abroad) in my almost decade of veganism thus far – from supermarkets, from small producers selling at veg fests, from vegan and health food shops. Some were waxy, some chalky, some bland and tasteless, some unoffensive and one so offensive I had to spit it out in the bin. I’m pretty picky when it comes to vegan cheese. So I’m excited to say I’ve found my new favourite vegan cracker cheese (the spreadable kind you put on crackers) in London. And it’s being made from scratch by a French cheesemonger and being sold side-by-side with dairy cheese in her gourmet cheese shop near Kings Cross. Wow. Never thought I’d see the day doesn’t even begin to cover it. So far the only vegan cheese I’ve found that I actively wanted to eat was either made by me (creamy herby cheesy spread), was not available in Europe (Miyoko’s Kitchen) or updated their formula so I didn’t like it as much (I’m looking at you, Tyne). I was so thrilled to see a new place pop up on Happycow two weeks ago – Cheezelo (Kings Cross) – and better yet, it’s local to me and the cheeses cost about half the price of most nut-based cheeses. If you love cheese platters and cheese and crackers, you need to go to Cheezelo – you can get a vegan cheese platter with vegan cheese, crackers, fruit and chutney and sit at one of the tables inside the shop or outside. Or go simply to marvel at vegan cheeses being sold in the cheese case alongside dairy cheeses. Mouse’s: everyone seems to be in love with this at the moment but it is really not the cheese for me. Sadly. I’ve tried the camembert and the ricotta; the ricotta was acceptable but the camembert made me regret ever putting it in my mouth. Like I said, I’m picky. As you can tell, I’m not really much one for packaged vegan cheeses (by this I mean ones that are based on soya or coconut and come in plastic packaging and have a long shelf life). I much prefer the nut-based vegan cheeses but these can be hit and miss. The vegan cheese from Cheezelo is one of the only vegan cheeses I’d actually go out and buy (plus Miyoko’s or the old formulation of Tyne). They offer a much milder flavour to Miyoko’s since they’re not fermented, but they’re perfect for a cracker. I’ve made half a dozen vegans sample Cheezelo vegan cheese now and they all liked the almond, lemon and dill flavour.Two of them said it was the best vegan cheese they’d had, full stop. Most also liked the herby cashew flavour. The other two flavours (peppercorn and almond-cranberry) divided people. One friend who makes her own cheeses (from Artisan Vegan Cheese) remarked she’d prefer her own cheese, or mine. So if you’re massively into making your own cheese, maybe you’ll prefer your own, but if you just want to buy some vegan cheese, here you are. Eleonore (the cheesemonger who makes the cheese) makes the cheeses fresh weekly, so it’s a soft, creamy, spreadable cheese, not aged and fermented. Think boursin, not blue cheese. Although Eleonore did mention plans to experiment with aging vegan cheese…or even trying to make a vegan raclette (YES PLEASE!). So far she has developed four flavours, and typically has two available per week (though when I visited her today, she had all four available). 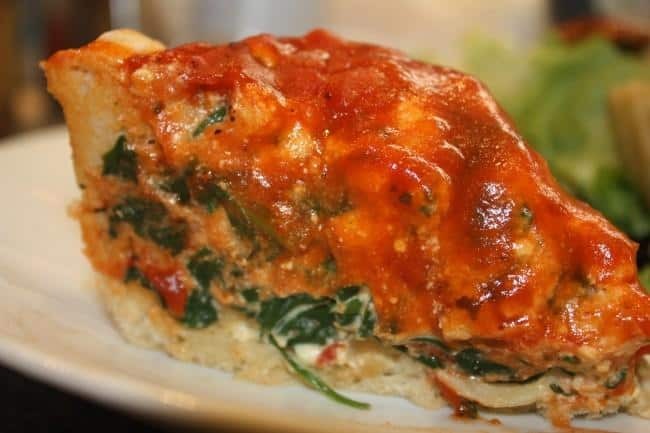 I like that the cheeses aren’t named by comparing them to a specific dairy cheese (because I think vegan food should be about creating delicious new things, such as tomato fish, rather than strictly trying to make an exact replica of another food, which often doesn’t work and results in disappointment). Speaking of names, I was invited to name one of the cheeses of my choice…if you have any ideas for a good name for a cheese, let me know! The hazelnut and pecan is probably the least cheesy of the four; it’s more akin to a pate (still delicious as a pate on bread though, just don’t expect it to be like a cheese). It’s also got a strong peppery kick so if you’re scared of spice/pepper don’t choose this one. The almond, dill, garlic and lemon and the cashew nut with mixed herbs were my two standout favourites. I’d eat these on crackers any day. I also stuffed some courgette flowers (zucchini blossoms) with the almond-dill cheese and battered and fried them. Heaven. The almond and cranberry wasn’t my favourite on its own on a cracker (something about fruit inside cheese is not my thing), but when I added some onion jam, it transformed into complete deliciousness (yeah, that’s a word now). The best part? These cheeses are much more affordable than most artisan nut-based cheeses in London! 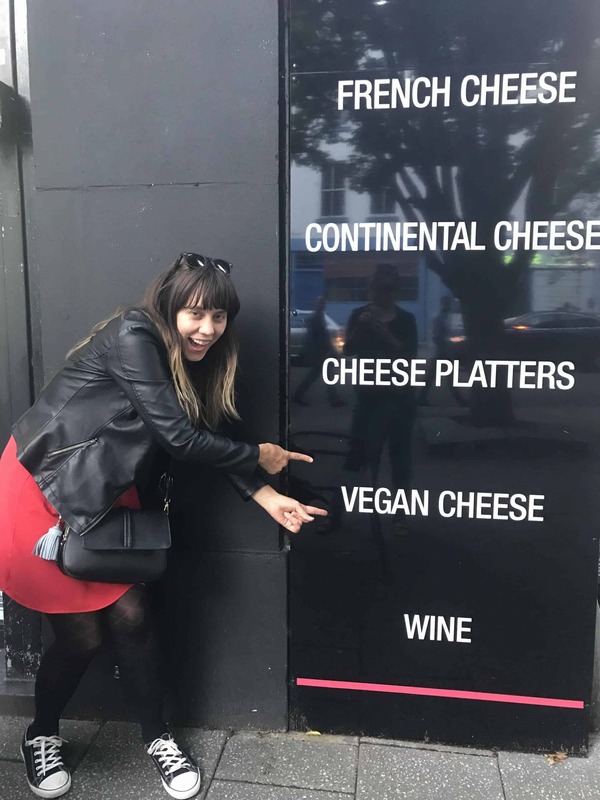 While nut-based vegan cheese seems to retail between £6 – £10 in London health food and vegan shops, Cheezelo vegan cheeses are £4.50 each or 3 for £12. If you’re making a vegan cheese platter, you could easily spend the same on a trio of cheese here than you might on a nut-based cheese from a whole foods shop. Eleonore’s mission is to spread the cheese love, and part of that is making gourmet cheese more affordable — and providing vegan cheeses for her vegan and lactose intolerant customers. You can get a round of cheese for £4.50 or 3 for £12. There are usually samples available in case you’re not sure of which flavour to choose. 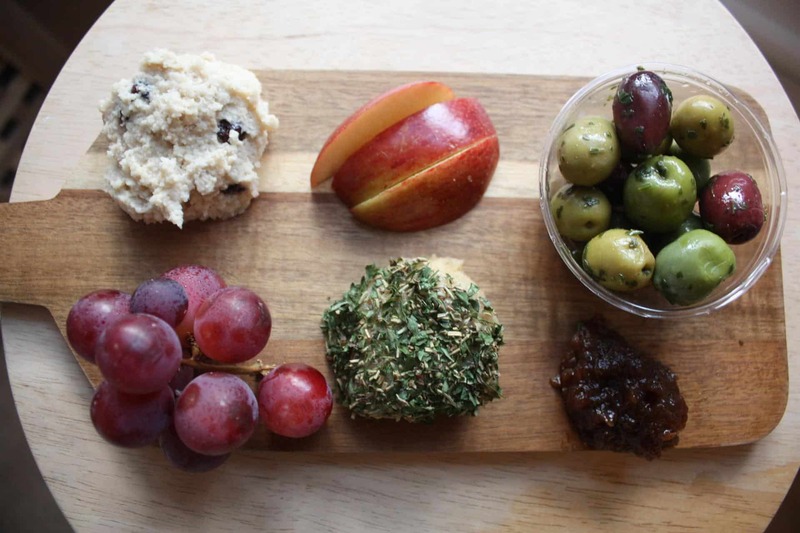 You can also get a vegan cheese platter to eat in for £10 (suitable for two people or one very hungry person), which comes with two cheeses, Hackney-made rosemary and olive oil crackers, fruit and chutney. The shop has some tables inside and a few outdoor tables so you can even eat your cheese board al fresco if the mood strikes and the weather complies. And if you’re having a cheese emergency, Cheezelo is on UberEATS, so you can get that vegan cheese platter delivered to your door. Unless you live locally (near Kings Cross) and can order on UberEATS you’ll have to go to the shop to buy as it’s only sold there for now. 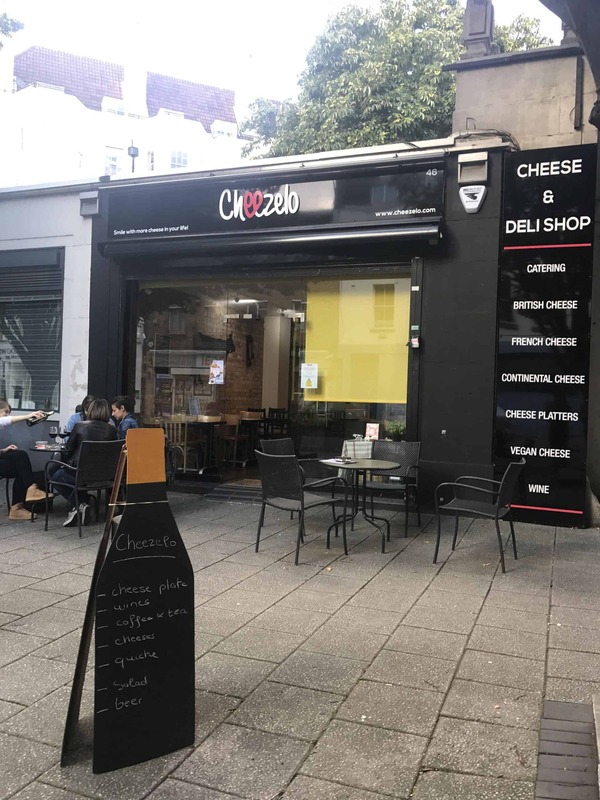 Cheezelo is located between Kings Cross station and Euston station, so head there if your train is passing through Kings Cross/St Pancras or Euston.